Spencer wasn’t really certain, but he was confident that the area should have a chamber. The pair decided to start a leadership group, the South Belt Community Association, composed of a handful of community leaders which included Dr. Parker Williams, who was president of San Jacinto Community College, and commercial realtor Rudy Schubert. The group met regularly and began a tradition, which still exists today, of working closely with elected officials. The small group had no by-laws, membership dues or any sort of structure. As the group became more successful in working with various projects, it became apparent that it was time to move onto the initial recommendation. By this time, Spencer had moved on to TCB in Tanglewood, and a new banker, Larry Wright, moved into the presidency of the First City Bank at Fuqua and the Gulf Freeway. Wright suggested that the group should sponsor a get-together of business leaders to see if there was enough support to start a chamber. This meeting was held in the administration building of San Jacinto College South. The small community group anticipated 20 or 25 people in attendance and were surprised at the more than 60 who showed up and strongly supported the idea of starting the chamber. The next step was talking to community leaders who would ante up $1,000 each to try and get the new organization up and running. Twenty-two stepped up to the plate. The initial board of directors and their representatives were: Ameriway (now Washington Mutual), Elba Olvera; Control Specialties, Randy Pennington; First City Bank-Almeda Genoa, Larry Wright; InterTec Financial Group, Bill Caraway; Memorial Hospital Southeast (then located on Bellfort), Steve Sanders; Mortgage & Trust, Charles Lusk III; Perry Homes, Jim Mavity; Almeda Mall, James Roberts; Sagemeadow Utility District, Jack Myers; Texas Commerce Bank-South Belt, Mark Ferguson; William L.H. Morgan, Jr; Ayrshire Corp, Ken Coquyt; Dan Boone Chevrolet, Dan Boone; Houston Lighting & Power (CenterPoint), A.C. Czigan; Kaparo Development, Karen Ross; National Directory Service, Billy Stark; Republic State Bank, Steve Hadlock; Rudy Shubert-Conglomerate (this included Dr. Mike Stokes, Dr. B. J. Garner and Larry Kurtz), Rudy Schubert; South Belt Leader, Marie Flickinger; Textool Co., Louie Wiess (soon replaced by wife Jacquelyn); and Trammel Crow, Lynn Thompson. The plan was to hire a director and work through September to obtain at least 75 members who paid for membership into the new group. If this was accomplished, the Chamber would be up and running; if not, the remaining $1,000 founding money would be divided among the non-officer members. The interim officers were: Flickinger, president; Wright, vice-president; and Schubert, vice president. If it was successful, the founding members would then pay their first membership dues. The original founding members were promised a permanent seat on the board (as long as they paid their annual membership fees). Eight of the initial companies are still on the board. Flickinger has the most tenure on the board, followed by Jacquelyn Weiss who replaced her husband shortly after the chamber was organized. The first chamber board meeting was held July 10. Les Haulbrook was the first executive hired to direct the chamber. The first chamber dinner was held Oct. 12. To the board’s amazement, the chamber started with 176 members, 101 more than the goal of 75. The first dinner featured then County Judge Jon Lindsay and flood control director Jim Green. Spencer, who originally suggested starting the chamber was also present as were David Hannah Jr and David Hannah III of Ayrshire Corporation who developed the majority of the residential property in the South Belt area. A first-prize award was given to Bobby Griffin for having signed up the most members; second place went to Karen Tollet. The Chamber Was Off and Running. 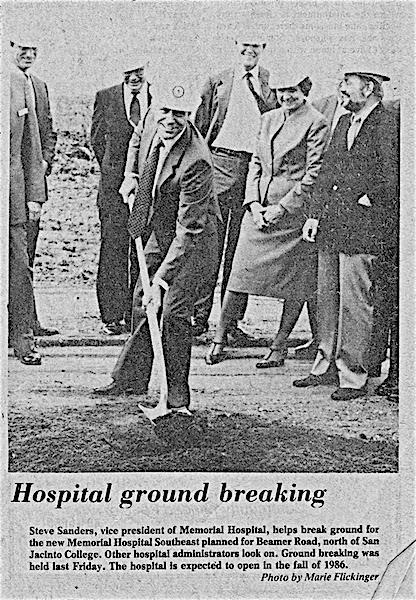 The first ground-breaking event hosted by the chamber was for Memorial Hospital which broke ground in the fall of 1984. Over the years, the effort of the chamber leadership has always been centered on working with elected officials to improve the quality of the South Belt community. Running a chamber in an area that does not enjoy the support of a city or high business or industrial area is difficult. But the South Belt chamber has survived against difficult odds due to the strong support of a dedicated core group. Constructing a stand-alone building for the chamber was quite a challenge, made possible by the efforts of a number of people but especially a handful who more than stepped up to the challenge. This includes Sherry and D.C. Trainer. Sherry, as director, undertook a fund-raiser which required selling 50 tickets for $100 each; D.C. did most of the selling. The Trainers moved on to the Pasadena chamber where Sherry served as executive director until March 2014, with D.C. at her side, but Sherry’s first job in chambers was with the South Belt chamber. Also aiding in the materialization of the dream of the chamber having its own building was Billy Burge of Ayrshire, who donated the land, and Jack Niday, who oversaw the construction as general contractor (at no charge) and also aided in various ways when the chamber hit rocky times. The attractiveness of the chamber building can be credited to the efforts of Chris Clark, who was responsible for the beautiful design of the building. There are dozens of people who have helped and deserve credit for the chamber being a vital part of the South Belt Community. There are too many to recognize, but one group must be acknowledged. George Valtasaros and wife Kathy and her daughter Ashley helped keep the chamber together during a rough four-year period. George, owner of The Gardens, gave tirelessly as president for three out of the past four years. Some of the more successful endeavors of the chamber have been in helping to get major construction projects done in the area. This includes such projects as the Scarsdale-Yost Road connection and multiple-lane bridges over the Gulf Freeway at Fuqua and Scarsdale. It also worked with County Commissioner El Franco Lee on projects such as the community center at El Franco Lee Park and, years ago, the establishment of the county courthouse annex and the Parker Williams Library. The chamber’s governmental affairs committee met with Commissioner Lee when he was first elected and began lobbying for the county complex which is currently located at Scarsdale and Beamer. Ongoing community events include a Fall Evening of Cuisine and the Spring Family Fun Fest. Both of these projects have become great social events for the community. The Evening of Cuisine, currently the major fund raiser for the Chamber, offers a great opportunity for chamber members to sample the great food of our local restaurants. The Family Fun Fest, held at Clear Brook City Park, includes a Fun Run/Walk, a Strut Your Mutt doggie contest, inflatables, and food, fun and games for all ages. The Family Fun Fest benefits the South Belt Ellington Community Foundation with all proceeds benefiting the programs of the TECH committee.